Happy 3rd Blogiversary To Me And A Giveaway To Thank You! | From Overwhelmed to Organized: Happy 3rd Blogiversary To Me And A Giveaway To Thank You! Happy 3rd Blogiversary To Me And A Giveaway To Thank You! 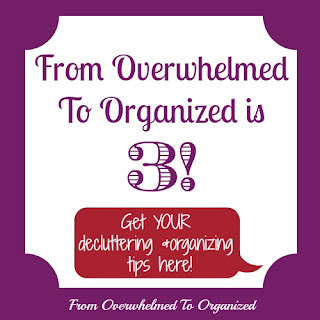 This week marks my third anniversary of blogging here on From Overwhelmed To Organized! I can't believe it's been 3 years since I started sharing my decluttering and organizing journey along with tips to help you declutter and organize your home. Time has flown by. Hundreds of you have collectively decluttered millions of items this past year! And I've thoroughly enjoyed getting to know so many of you through the 365 in 365 Facebook group, as you share your decluttering efforts every day. This year we've had many new members jump in, as well as veterans from last year who are continuing their journey to a clutter-free home. I'm inspired and encouraged by each one of you! This blog got a much-needed make-over, with drop-down menus added to the top and a streamlined sidebar, making it easier to find the tips and ideas you want. I've guest posted on several blogs and invited other blogging friends to guest post here. 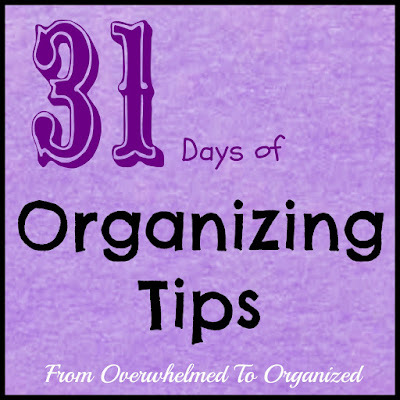 It's been fun to share my tips with new readers and introduce you to other organizing bloggers. My professional organizing business has really grown this past year and I absolutely love being able to help people in person as well as online. Working directly with clients has made me more aware of the tips you would benefit from. And writing tips on the blog for the past 3 years has made it easier to help my in-person clients. It's a great combination of and I love both jobs! To celebrate my 3 year blogiversary, I'm going to look back this week on the past year's most popular posts. Each day I'll share a post from the past year that was popular as well as an older post that was still a favourite for many this year. These may be new to some of you or a great little flashback for others. And to thank you for your support all year, I'm giving away 2 great organizing ebooks AND a $25 gift card to Target (for my US readers) OR a $25 Solutions gift card (for my Canadian readers). Make sure you enter in the Rafflecopter form at the end of this post! This was one of my favourite posts to write this past year and I'm so happy it has resonated with people. I mean it's basically the whole purpose of both this blog and my organizing business... helping overwhelmed people declutter so they can get organized and stop being overwhelmed! 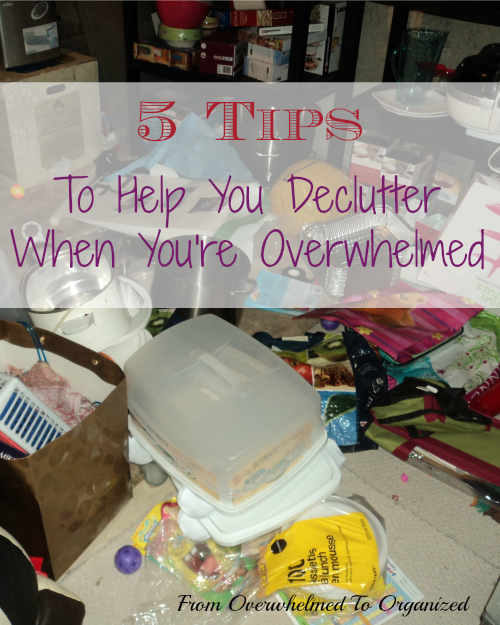 If you haven't read it or you need a refresher, check out these 5 Tips To Help You Declutter When You're Overwhelmed With Stuff! Congrats!!! Gonna come back and enter the giveaway when I get on my computer! Congratulations on the Anniversary and keep up the great work! Congratulations! You have grown as a blogger. Your information is great. Congratulations on your 3rd Blogiversary! I have always enjoyed your "31 Day" series of wonderful tips. Thanks for all your organizational help. I need all the tips and assistance I can get! Congratulations, Hilda! :-) It's hard to pick just one post, but I agree with Pat above...the 31 days series was great, and I love all of your specialized Pinterest boards. Congratulations, again, and thank you for the opportunity to win! Happy Bloggy Birthday!!!!!!!!!!!!!!!!!!!! Wishing you many more to come. Congratutions. I have my one year bogging anniversary tomorow, and it has been a fun year! I am actually new to your blog, will have to check out the tips to organize, I could use them.